Probably optimistic. We have a minimum of 19 games remaining and playing in a deeper position a lower goal return is to be expected. Would be fantastic if he did pass Rowley. He will break Charlton's record. v Fulham (26th January 2013). v Southampton (30th January 2013). Rooney's got his scoring boots on now it seems. Still think it's a bit too much to expect him to pass Rowley this season though. He'll finish the season on 202-207.
v Fulham (2nd February 2013). Rooney's career record at United is a goal every two games. He will need another 102 games to beat the record if he maintains the same ratio. He should definatly do it, unless he gets a bad injury. If he continues this scoring form, he may well pass Rowley. But as we've seen in the past he does go on these runs and then stops scoring. Hopefully that won't happen this year. 16 from equalling Charlton's record, Cordon. This is something i'd be surprised if he does. Everyone said Owen would do it but that went pretty quickly. Owen's fitness problems probably prevented him from breaking the record. I think Rooney will break the record. There are nine international fixtures left in 2013 including one against San Marino where we could score a hatful of goals. I reckon he's got at least another 5 years in him, he may call it a day after World Cup 2018. He has said he wants to be picked for every England squad when available. Based purely on stats (current goal-appearance ratio and 9 internationals per year) and my maths is correct (!) he will need to play for another 4 years to equal Sir Bobby’s England record. It will take him 6 and half years if he is only available for 2/3 of the 9 internationals. His goalscoring has gone down though. Scored 18 goals in last 5 years (2008-2012) but 11 of those were in 08 & 09. Is he the same player for England now? Under Capello he was a goalscorer, i'm not sure now, apart from last night he's usually playing behind the main striker, in the bigger games he'll probably be the main man upfront but for the majority I think he'll be deeper. 2010 was a bad year for him. He only scored 1 goal in 11 appearances. Other than 2010 his goal scoring record is fairly reasonable. 2012: 4 goals in 5 appearances. Total for 6 years: 19 goals 39 appearances. Availability is key. I think he will come close to or break Sir Bobby's record if he can play 6-8 games per year. v QPR (23rd February 2013). Giggs making a late charge! Now 7th on the list. v Norwich (2nd March 2013). 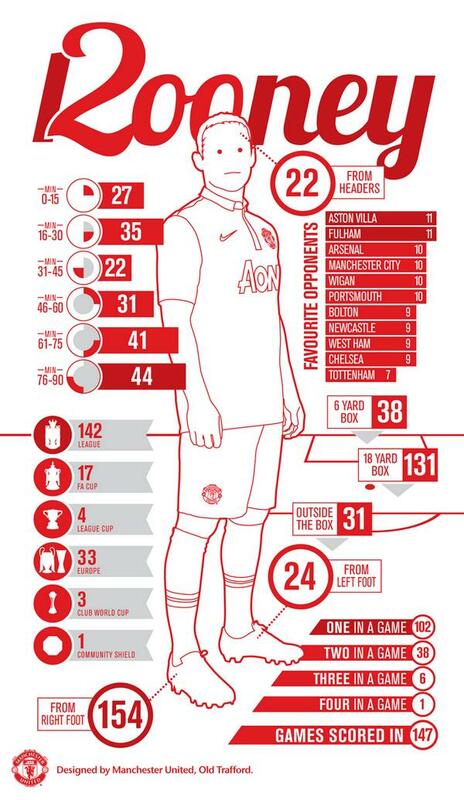 Can Rooney get third this season or is that just a bit too far now? Unlikely I'd say. We have a minimum of 12 games remaining and a maximum of 19. Has a chance if we play the maximum number of games. Madrid is not all Rooney has in his sights. He is closing in on the dual target of 400 games and 200 goals for Manchester United. And boss Ferguson has set him a target of 25 goals for the season — with Saturday’s cracker putting him on 14. He added: “It’s great to have played so many games for this club at such a young age and it’d be nice to reach the 200 mark. As for Fergie’s target, he told Inside United: “Yes of course I can reach that. It’s great for us to have so many forwards who can play well and score goals. “That shows the quality we have in the squad. We’ve scored a lot of goals. v Chelsea (10th March 2013). v Reading (16th March 2013). If Rooney stays injury free I reckon he breaks the record by the end of the 2015/16 season. v Crystal Palace (14th September 2013). v Bayer Leverkusen (17th September 2013). For a chocolate brownie, who did he score 4 in a game against? v Manchester City (21st September 2013). v WBA (28th September 2013).